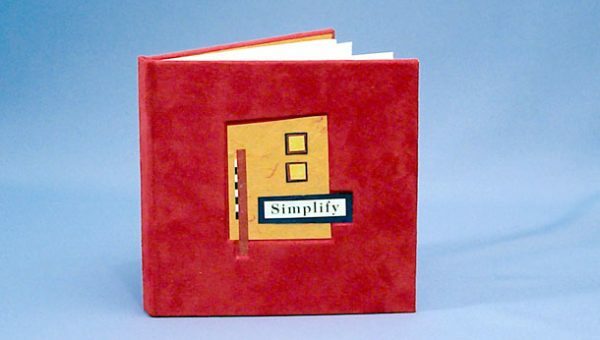 A limited-edition artist book of inspirational quotes about simplifying one’s life. Explores ideas to reduce the complexity and chaos of our fast-paced world and reasons to appreciate the simpler pleasures in life. Simplicity quotes laser printed on Mohawk Superfine paper. Handmade paper collages on interior and cover. Cherry red suede leather cover. 5.5” x 5.5” x 42” Edition of 20. Presented in a matching slipcase. Signed and numbered. 2001.